As a child, I always dreamed of being one of the golden ticket winners in Willy Wonka and the Chocolate Factory, so you can imagine my excitement when I found out we were visiting a real life chocolate factory in Dunedin, New Zealand. Labeling myself as a chocoholic would be an understatement. A more accurate title would be something along the lines of “self-proclaimed chocolate connoisseur.” My qualifications? Gobbling down an obnoxious amount of sweets for twenty-one years. So obviously, I was pumped. 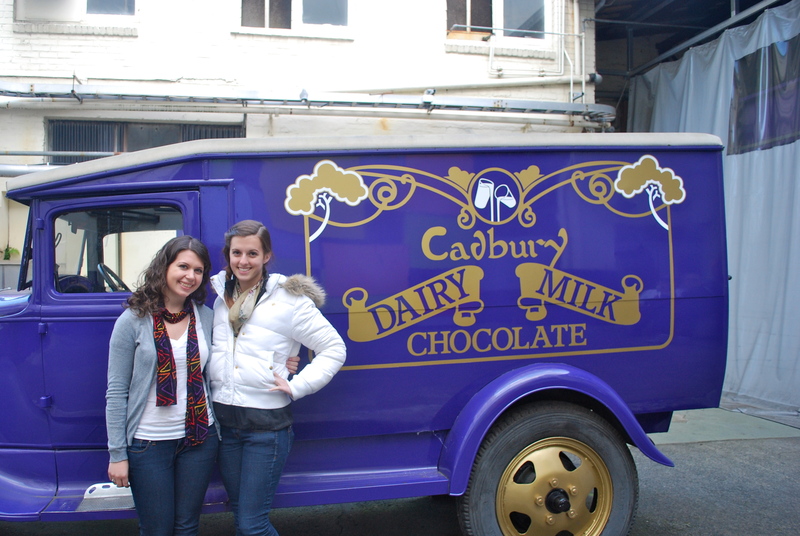 Kim and I ventured out to find the Cadbury Chocolate Factory. When we saw it, it was like one of the moments in movies when the choir of angels sings “Hallelujah”, and there is golden light surrounding the prized object. The purple banners hanging from the building were waving triumphantly, luring chocolate lovers passing by to its entrance. When Kim and I entered the building we checked in for our tour and took a lap through a mini maze showcasing the history of chocolate. It started with chocolate’s humble beginnings as a mere cocoa bean and continued on to the spectacle it has become today. When the clock struck three, our tour guide Pat appeared. Pat was a jolly lady rocking purple overalls, pockets overflowing with an assortment of candies. She equipped us with hairnets (yet another flattering piece of clothing) to wear throughout the factory. She also gave us a purple bag of numerous Cadbury confections (including one of my Easter favs: crème eggs). At different points of the tour Pat would ask chocolate trivia questions and the winner would receive (what else?) chocolate. In the Easter egg wing, we saw workers handling delicate chocolate eggs in preparation for next Easter holiday. At the end of this wing stood a replica of the world’s largest chocolate Easter bunny…basically a dentist’s worst nightmare. Pat said the oversized figure still holds its placein the Guinness Book of World Records. 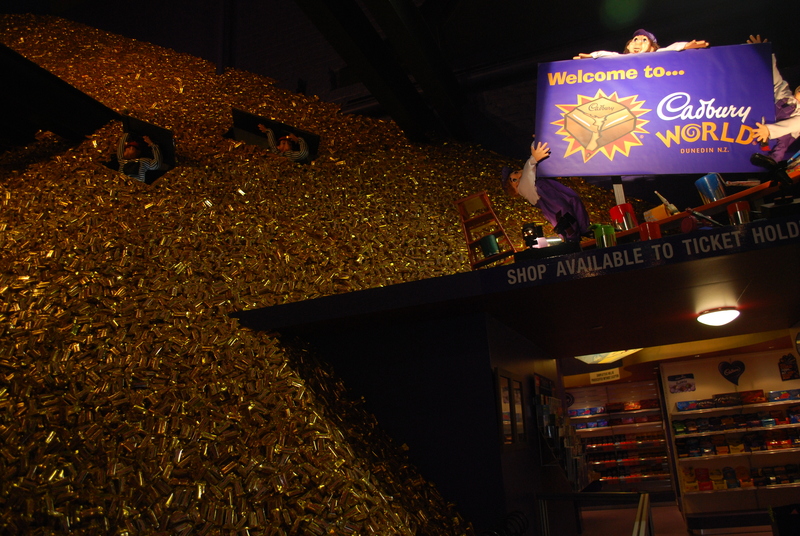 Perhaps the most impressive and “Willy Wonka”ish moment of the tour was the voice-activated chocolate waterfall. As we screamed “we want chocolate” gallons of melted chocolate cascaded into the vat below. The sweetest part of the day? The goodie bags. Cadbury sent us home with heaps of chocolaty treats to enjoy and offered more options in the outlet store. So the moral of the story is: follow your sweetest dreams. Just beware of cavities. Posted on July 5, 2011, in Destinations, New Zealand and tagged backpacking, Cadbury Factory, Chocolate, Dunedin, Magic Bus NZ, new zealand, Travel. Bookmark the permalink. 2 Comments. how does it compare to the American style of chocolate? We think that the world is too big and too awesome to not explore, so that’s exactly what we’re doing. We’re throwing on our backpacks and heading out to discover the hidden gems of the world. We’re keeping you updated on our adventures along the way with the goal to inspire, educate, and motivate YOU to step out of your comfort zone, travel, and enjoy what this world has to offer. You've got the world at your feet. Please note: All photos, videos, and writing on https://theworldatyourfeet.wordpress.com are copyright of The World at Your Feet, unless otherwise indicated. If you'd like to use a post, picture, or video, please email us at theworldatyourfeet2@gmail.com and link back to our site. Thank you!